Never miss a call, even if you lose power or Internet. You can set your calls to route to any extension, voice mail or external telephone number. With Cloud9Phone’s redundant & peered network, your PBX is always up and running. Intuitive App Interface makes it easy to use & learn. 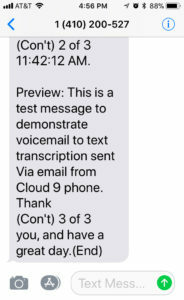 Voice Mail messages are transcribed to text using Google’s AI Engine and delivered via Email and/or SMS Text Message to your mobile phone. Ring Groups are commonly used within a companies different departments, such as sales, service, shipping, etc. Simultaneous Ring Groups, allow for multiple extensions to ring at the same time when the ring groups pilot number is dialed. Terminal Ring Groups always starts at Extension-A, then if Ext-A is busy it will hunt to Ext-B and so on. Circular Ring Groups, steps it’s way through the Extension list, starting where it last left off. Ext-A, then will hunt to Ext-B. But even after Ext’s A & B hang up, the next call will Start at Ext-C.
After making or receiving a call, a user may conference in any third party for a 3-way call from their telephone. Allows callers to select from menu options using a standard telephone keypad. 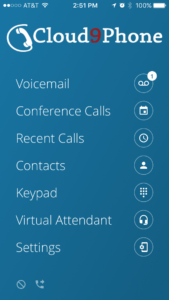 Through the portal interface, calls can be routed to extensions, mailboxes, groups, conference rooms, call queues, or unlimited depths of additional auto attendants. Multi-Level Automated Attendants allows for separate telephone numbers to be routed to unique Top Level Auto Attendants. Each Auto Attendant is configurable individually. 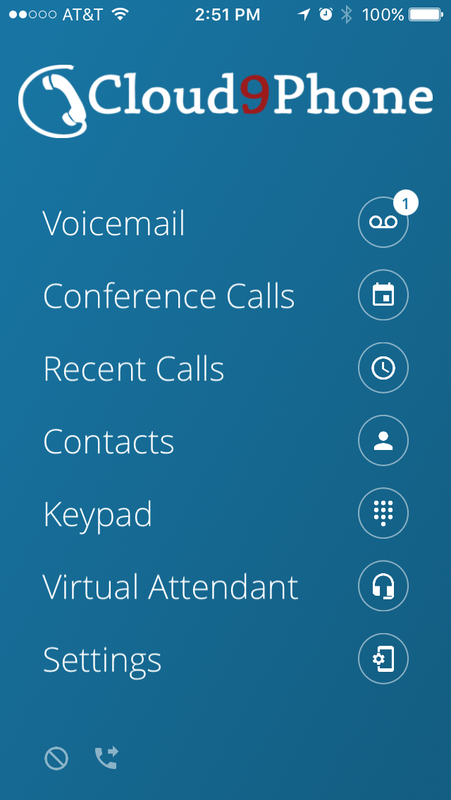 Forward calls via the Cloud9Phone Portal to any extension, mailbox, or external phone number. Automatically forwards your calls to an extension, group, or external phone number when you do not answer your phone. Automatically forwards your calls to an extension, group, or external phone number when your extension is busy. Automatically forwards ALL your calls to an extension, group, or external phone number. Associate a voicemail box with an extension to take messages. Use an announce-only voice mail box to provide customers with a pre-recorded message for hours, directions, etc. when they choose an option off the auto attendant or extension. 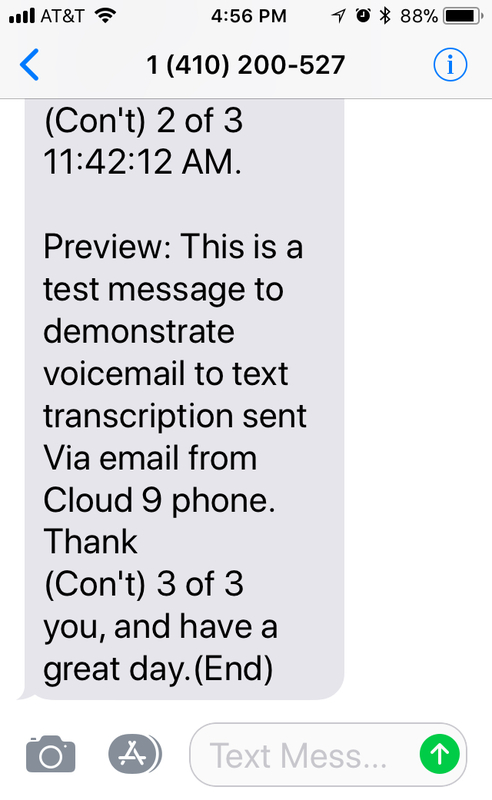 After a voice mail message is received, the Cloud9Phone PBX will send the message to your email. The message will include the date/time of the call, as well as the duration, caller ID if provided, the mail box number, and an attached WAV file that can be played on your PC or mobile device (ie/ smartphone or PDA capable of playing WAV files). Don’t have a smartphone or PDA capable of playing WAV files? 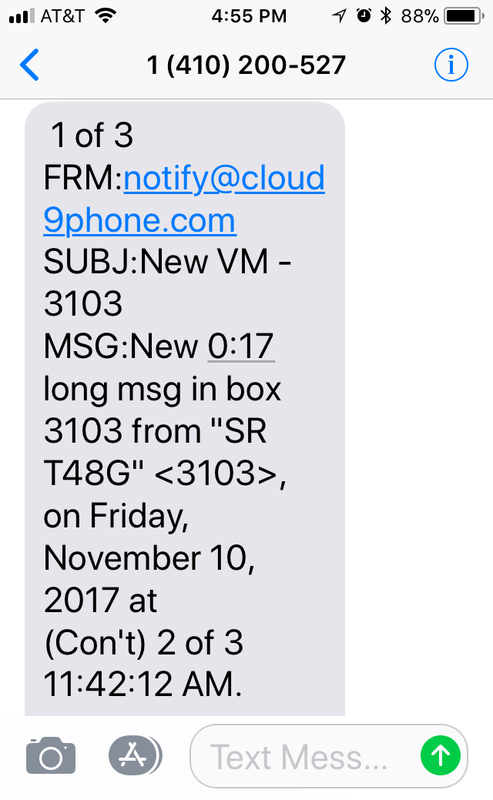 Enter an SMS address in the Cloud9Phone Portal and receive a shorter text message to your device, 3rd party text messaging charges may apply. See the Name & Number of the person calling you. You can set the name & number that you want the person who you are calling to see. This setting can be your company’s main phone number or any existing number that is with Cloud9Phone or anonymous. Route calls from a unique incoming phone number to any auto attendant, extension, group, phone number, or ACD or Call Queue. Force callers with “no caller ID” or “blocked caller ID” to enter a phone number that will be presented as their caller ID. You can use Cloud9Phone’s royalty free default music and messages or upload your own custom files in MP3 or WAV formats. When you place a caller on hold, you can choose from a selection of default royalty free music or upload your own in MP3 or WAV file format. Record custom Automated Attendant Greeting for callers to hear and make selections. As an optional service, Cloud9Phone can create studio quality, professionally recorded greetings, music & messages. Your Cloud9Phone Hosted PBX can support 2, 3, 4 or more digit extension dialing. You can restrict outbound international calling by extension. You can restrict all outbound calling by extension, except E911. Calls to other extensions on your Cloud9Phone PBX are considered internal calls regardless of where they are located in the USA. Call queues are used to route calls in a first-in-first-out manner to the appropriate extension or group. These extensions can be agents logged into the system. Call Queues can be programmed independently or used with an ACD, where the callers hear an announcement that says something like “thank you for calling, all available agents are busy, please hold for the next available agent, or press N to leave a message”. When the call is ready to be routed, the ACD handles the routing rules. Allows routing decisions based on time and date. Multiple schedules can be configured, as in the case of departments or locations with different hours of operation. Real-time call logging is available via the portal. From, to, call duration, date and time, and call type (International, On-Net, etc). In addition, frequently called numbers can ‘tagged’ with text descriptions for legibility. Track number of calls by individual extension. 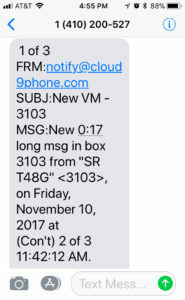 Track orders, invoices and all Cloud9Phone billings online. 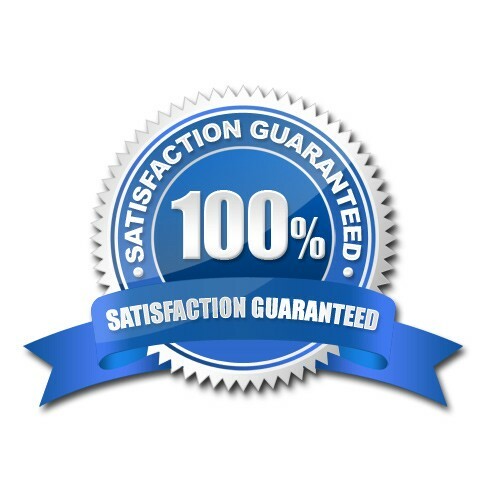 Record all calls inbound to one or all of your telephone numbers. Record all Inbound and/or Outbound calls from any/all of your extensions. Record calls inbound to any/all of your ACD Call Queues. Search, review, listen, download call recordings via secure online web portal.